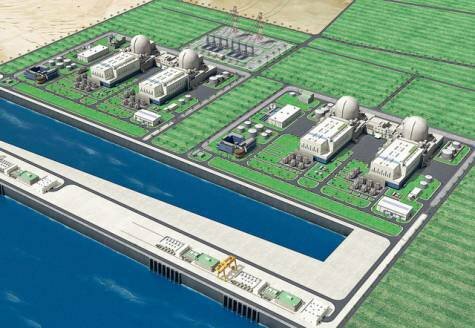 Gas aplenty, but UAE opts for nuclear – a lesson to be learned? Well, that is until I emailed Ziggy and asked if he would mind me posting a version on BraveNewClimate… he said okay, and so here it is! The comparison he draws between the United Arab Emirates and Victoria (Australia) is both fascinating and pertinent. See what you think. Oh, and I love that last sentence. I’ll be filing away that one for future use. The largest commitment to new nuclear energy in this past year was made by the United Arab Emirates which placed an order for four reactors with a consortium of South Korean companies. There are some aspects to this decision which have relevance to the debate about nuclear power in Australia, and a comparison with the state of Victoria is especially revealing. The UAE shares borders with Qatar, Saudi Arabia and Oman and a 650km coast line along the Persian Gulf. Made up of seven states, the UAE covers an area of about 84,000 square kilometres and is home to about 5 million people producing $400 billion in GDP (a fifth of which are oil exports). By comparison, Victoria covers nearly 240,000 square kilometres, has a population of 5.6 million and a gross state product near $300 billion. UAE produces about 70 Terawatt hours of electricity annually, almost entirely from gas. Victoria produces about 50 TWhrs primarily from coal. Both economies are totally dependent upon fossil fuel and produce similar amounts of global warming greenhouse gases. For many key energy metrics, the UAE and Victoria might be interchangeable. Yet their strategies to meet future energy needs diverge dramatically. In 2007, the Gulf Cooperation Council made up of Bahrain, Kuwait, Oman, Qatar, Saudi Arabia and UAE undertook a study of the peaceful use of nuclear energy. These six member states share a common electricity grid, a hot dry climate and so confront similar needs for more energy to power desalination plants, air conditioning and so on, as well as to support strong regional economic growth. They are all signatories to nuclear non-proliferation treaties and other safeguard agreements. From this and other UAE studies, nuclear power emerged as “a proven, environmentally promising, and commercially competitive option which could make a significant baseload contribution to the UAE’s economy and future energy security”. The UAE is the fifth largest oil producer in the world, is in a gas-rich geography with global leader Oman as its neighbour, and is a desert where solar energy might be favoured.Yet the preferred path was introduction of nuclear energy sufficient to generate 20% of UAE needs by 2020 and up to 50% by 2050. There is no carbon price in the Middle East to discourage fossil fuel use yet key economies are making considered decisions to introduce nuclear power. While some Australian commentators argue against nuclear energy because ‘we have better options such as solar energy’, when countries undertake careful risk adjusted analyses of the merits of all options, nuclear power compares very well. Similarly, it’s not hard to identify countries with an abundance of wind which are increasing their commitment to nuclear for the same reasons: nuclear technology is well understood and proven, reactors run 24/7, they couple into electricity grids seamlessly, and produce baseload electricity at competitive costs. Specifically in the UAE case, four identical reactors with a total capacity of 5.6 GWe (this is half of Victoria’s current capacity) were ordered at a price of $20.4 billion. The suppliers formed a consortium including familiar names like Samsung, Hyundai and Doosan led by the Korean Electric Power Company. After evaluating ten possible locations, a single site has been selected for all four reactors – Braka, a westernmost coastal city near Qatar and the Saudi Arabian border, and 300km from the UAE’s largest city, Abu Dhabi (population 1.7 million). Braka was chosen because of its access to coastal water for reactor cooling, the presence of existing energy infrastructure, stable seismic history and location in a sparsely populated area (akin to much of the east coast of Australia). Construction is to start next year with the first reactor producing electricity in 2017, and all four online by 2020. A commitment to tight construction schedules was a defining feature of the winning bid and reactor build times are now routinely quoted at less than five years in many places around the world. The plant is substantially financed by the state but will have Korean equity partners. Similar to existing public-private partnerships in water and power, UAE anticipates an eventual 60%-40% ownership split between its government investment arm and JV partners. In this UAE case, we have a complex economy approaching energy strategy in a considered but expeditious way, evaluating a number of available technology platforms against the requirements for clean electricity, energy security, matching of capacity to strong demand growth, future proofing and so on. Nuclear energy emerged as central to the solution. A similar approach in Victoria would probably point to coastal Gippsland as the preferred location of the first 2-4 reactors. As nuclear capacity is built, older coal-fired power stations could be closed and GHG emissions sharply reduced. Proximity to the 500kV transmission system also offers the potential to export electricity to NSW and through western Victoria to SA. Yet in Australia we’re still debating about whether to have a debate about nuclear energy. Ziggy Switkowski is chancellor of RMIT University and recently completed his term as chair, ANSTO. Korea has focused attention on its APR-1400 design, with domestic overnight costs of $2,333/kW. A recent contract for $20.4 billion has been signed with Korean consortium KEPCO to build four APR-1400 reactors in the United Arab Emirates, at a turnkey cost of $3,643/kW. This price is notable considering that it is offered under near-FOAK conditions, because these will be the UAE’s first nuclear plants. It’s certainly a case study that bears serious consideration for the Australian government. Message: Choose nuclear over gas! Finally, for those who didn’t notice my Twitter feed, I’ll be featuring on ABC TV’s show “Big Ideas” on Tuesday (ABC1 at 11am — short excerpt) and Saturday (ABC News 24 at 1pm for an extended 1 hour version). It’s based around my TCASE series run with the RiAus — specifically, the sustainable nuclear power event. You can watch a 7 min preview clip here on the web. Be sure to tune in, and tell your friends! I know next to nothing about the UAE. Are there particular features of its political economy that are different to Australia’s that enable this sort of clean, expeditious decision making? Its because of the underlying timidity in our Australian population that I decided to stand as an Independent candidate in the forthcoming NSW State Election. I am running primarily on stopping climate change and coal mining and promoting clean energy. I’m holding up the French deployment nuclear power ans an example that we should emulate. So thanks Zyggi and Barry. you and others do the best you can and I’ll try to get the ear of the electors. Well, it’s not what you’d call a liberal democracy — the Sultan and his family (based in Abu Dhabi) is very much the principal rulers (the Sultan is also the President), and the royal family is extraordinarily rich. But that said, it’s a well-ordered and rapidly developing society. I visited there for about a week, 2 years ago, when I was part of the panel of assessors for their new national research foundation grants. They’re pursuing high tech industries and building a research base quite rapidly. And Dubai just has an extraordinary number of skyscrapers under construction (as well as an indoor ski slop that I visited, inside a large shopping centre) — no wonder they need all of the new power. I gather that the UAE’s current gas powered desal is largely thermal such as multistage flash distillation. With the nukes I gather all the warmed cooling water will get washed out to sea and not used in the desal which will be 100% electrical via reverse osmosis. An advantage I guess is that RO can be done as inverse peaking for steady output baseload plant since fresh water is a storable product. The generally cited capital cost for this facility is $3.80 per watt of electrical output if I recall. What if it costs more and the construction is years late? If this succeeds it will set the template for coupled desalination and electricity production world wide. I would modify the message to – For base load power choose nuclear over any other form of power generation. Good luck, Robert Parker,in the coming blood bath for Labor in NSW – an eminently deserved blood bath. There is no carbon price in the Middle East to discourage fossil fuel use yet key economies are making considered decisions to introduce nuclear power. Pricing carbon (i.e. taxing electricity) is bad policy. The push to impose a carbon price in Australia is politically driven, not policy driven. This demonstrates UAE is capable of doing objective, impartial, apolitical analysis – unlike Australia!! The reason some Australian business leaders are supporting a carbon price is they realise it is impossible for Australia to make a rational decisions like UAE and all the other G20 countries. We are riven by political agendas, so that politics trumps policy every time. The plant is substantially financed by the state but will have Korean equity partners. This might be what we should do it here too (Douglas Wise, note :) ). There is a precedent. Australia is spending $50 billion to nationalise our communications system with a government owned and operated monopoly broadband network. The government argues it will be commercially viable by 2030; so they argue they are building an asset so the $50 billion expenditure (equivalent to half our national debt) does not have to be included in the budget. This is a ‘tricky’ slight of hand. But the NBN will probably be obsolete before 2020, let alone 2030, so it will never be commercially viable. Instead of the government wasting $50 billion of tax payer’s money on nationalising our communications (and banning all competition and banning all Freedom of Information requests about it), surely it would be far more valuable to divert most of the $50 billion to building low-cost, clean electricity and avoiding a damaging, economy-sapping electricity tax. We should be able to have the first 5400MW for no more than the UAE contract ($20.4 billion) and the next 5400 MW for less. Perhaps 16,000MW for $50 billion. That would supply most of the current base load on Australian National Electricity Market (NEM). What an excellent article by Ziggy Switkowski – and your comments too. and I hope you might leave the door ajar (be open to all options and show no preference) regarding your support for carbon pricing. ABC interviewers and audiences are predominantly Labor-Green supporters, so I expect you will be pressured to say all you can to support Labor-Green policies. I believe you could help to achieve good policy (as opposed to politics) by encouraging the audience to at least consider that pricing carbon is not the only way, and perhaps not the best way. I am convinced it is definitely not the best way. What stood out for me in this AFR op-ed piece, which was published last Thursday, was the striking comparison between UAE and Victoria. Obviously, Ziggy picked out the comparisons that suited his argument (don’t we all? ): plenty of available gas, good solar insolation, similar sized economy, similar sized energy demand, current dependence on fossil fuels, interconnection to neighbours grids etc. So why would UAE go for nuclear rather than gas and solar? Australians really need to ask themselves this important question. The Arabians are not stupid. They don’t like wasting money any more than the rest of us. Perhaps Dr Diesendorf might like to offer an answer. Thanks to Martin, by the way, for tipping me off about the article in the first place, and suggesting I contact Ziggy. Peter, I won’t be doing a live interview for “Big Ideas” — the show consists of clips from my RiAus presentation and the follow-up discussion with Gus Nathan and Kim Talus. Excellent point. And thank you for allerting Barry to the post. Barry, OK, but the point I was trying to make is a general one, not just for the ABC “Big Ideas” program. is that even in the world’s most prolific and readily available oil and gas, nuclear can be the economically rational choice without a carbon price. If that is the case in the UAE, then why should we damage our economic competitiveness by imposing a carbon price. Clearly, if UAE is not imposing a carbon price then poorer countries certainly wont do so. Imposing a carbon price in Australia not only raises the cost of electricity, of virtually everything, and damages the economy (permanently), it also handicaps outr ability to contribute to helping other countries to implement low cost, clean electricity generation. If the cost of nuclear in Australia is higher than elsewhaer, who is going to look to us for help. Raising the cost of electricity in Australia means nuclear will be higher cost then it needs to be and higher cost than it will be in other countries. That damages our economy. As for the UAE cost remember it has no industrial base, almost everything is imported included labor, and customarily 40% of any contract is set aside for bribes. There’s where the $2.3B/GW becomes $3.6B. The tried and true Candu has been selling for $2B/Gw with 4 year build times the most recent in Europe in 2007. I’m sure that AECL would be happy to sell Aus one for that price – cheaper than coal up front with half the operating cost. . Thank you for that info. I’ve been trying to get reliable captal and operating cost figures for Candu6 for a while. Can you give some links where we can get recent, up to date figures for ne build CANDU, and especially any figures from Europe. Sorry Peter Lang, but you’re clueless when it comes to the NBN. You’ve clearly got no idea. And you haven’t explained your opposition to a carbon price, something that every single orthodox economist (and most heterodox ones too) believe is the most efficient and effective way of reducing emissions economy-wide. The article says that Australian coal will cost 11 euros per Mwh while local gas will cost 26 euros. I didn’t see a figure mentioned for nuclear. The article points out that Middle Eastern countries have been exempted from the Kyoto Protocol so they have less incentive to decarbonise. Perhaps talk of international carbon taxes has already put a cloud over reliance on imported coal. Well you may be an esteemed geologist, but you’re aint much of an economist (or telecommunications expert). Mandating a solution such as nuclear is absolutely not cheaper, saves no money over letting investment decisions occur with a steady price on carbon pollution. A carbon tax would cover more than the stationary energy sector and would drive real behavioural change. If the artificial ban on nuclear power was removed, a carbon tax would make nukes more appealing, coal less so. And please don’t quote Henry Ergas, he has no credibility left, he’s prostituted himself to the Abbott opposition, doesn’t accept scientific climate change, and is an IPA fellow. Anyway, this is all angels on the head of a pin stuff. you have about as much influence over these matters as me, and we’re getting a carbon price sometime soon. not before time either. You haven’t followed. You’ve misunderstood and misrepresented Until you are prepared to catch up on the background there is nothing constructive we can discuss. You’ve clearly prostituted yourself to the Greens-Labor aliance and dogma, so your contributions are worthless. 1. Nuclear cheaper than coal in Australia. How? 2. To put this figure ($11 billion – see above link) in perspective, this government has already committed us to $10 billion of spending on renewable energy and energy efficiency; I expect this figure would be roughly doubled if the states’ commitments were included. 4. Which first? Carbon price or remove impediments to low-cost nuclear? 6. Subsidies that encourage fossil fuel use in Australia. It is an update of a 2003 paper by Mark Diesendorf. My thesis is that removing the impediments to nuclear would mean removing all such subsidies and many other distortions (including for renewable energy) that favour fossil fuels and renewables and therefore act against the entry of nuclear power. then read to the comments from the last link to the end of that thread. Wow, that’s a rude way of trying to win me over. You cannot reasonably assume that I read your rubbish diligently. Barry Brook’s already told you not to assume that. In fact, I had done a bit of further reading around here, and I discover that your post above is a cut and paste of another post you made recently. I also discover that you’re a climate science denialist and believe all sorts of myths about DDT and other things. Also, you admit that you don’t know much about economics (you didn’t need to admit that), and you accuse me of Greens-Labor while proposing your own left-wing statist intervention into Australian energy markets. You still haven’t actually said why a carbon price is more costly than your solutions, apart from some fanciful wishing and ideological stalking horses about big bad gummint and teh evil unionz. But anyway, my original point remains – out in the real world, you will lose this argument. I caculate that if all natgas imports were replaced by domestic production, UAE is currently consuming ~1.4% of their proven reserves per annum; a mere 71 years worth (not taking into account future growth). I suppose the AP-1400s have a design life of 60 years and are likely to be re-licensable for another 20. Apparently this Chinese is build is about the same as all the other Candu builds in the last twenty years. $2.0 /Gw . AECL has built so many Candu’s they’ve got new construction down to almost factory efficiency. Peter Lang, regular visitors to this blog really understand the point you’re getting at. It is getting to be a bit monotonous for my liking :) . Anyway, carbon price or not , nuclear is the only answer whichever way you look at it. @John Newlands commented above (10:32 14 Feb) that reverse osmosis would be necessary for the desalination as the plants’ (~20 GW) low temperature heat output was not planned to feed a distillation cascade. If we are not vigilant, that also may be part of the paradigm for Australia. One minister is likely to announce a vast capital commitment to electric power, and a subsequent minister will announce a vast capital commitment to desalination. If only our planners and politicians were willing to articulate the word, “and” in the phrase “Power and Water”, we might hear announcements of magnificent cost savings achieved by a Minister, as he declares that electricity and fresh water will be created in the same package deal. Planners could then put a power station wherever the consumers are, whereas a fossil powered station must be near railway lines, pipelines and lots of water. The fact that no one is prepared to consider the message in Ergas’s article seriously supports my contention that BNCers do not want to know about any alternative to carbon pricing. Carbon pricing is the symbolic gesture they want. They cannot entertain the idea that a carbon price may be bad policy. Such avoidance has precedent. Groups of similar persuasion didn’t want to consider whether preventing nuclear energy was bad policy, or whether promoting renewables was bad policy (I could go on but you get the message). Read the comments on this article on ABC the drum, another good case for an economically rational approach. http://www.abc.net.au/unleashed/42196.html The comments are overwhelmingly silly, ad hominem attacks like Wilful’s. Thank you for the two links with costs for the Candu6. I realise that we cannot compare, meaningfully, costs of Candu6 and other alternatives in Australia without defining the reguriments (and the impediments that will remain in place) and also having a full breakdown of the cost components. Comparisions have to be made on an equivalent basis. Hardly a credible economist. He’s a political appointment, just like Sir Nicholas Stern. They would not have been appointed to their tasks if they were not going to give the answer their clients wanted. Just more partisan propoganda. Peter – if Garnaut gave the government the answer they wanted why did Wong say his was just one person’s opinion, and why was there was no action on his recommendations? How come people are not credible when they have a different opinion to yours – oh, I forgot you are always right aren’t you. It must be a trial to be so perfect(ly) opinionated.How can you accept a scientific opinion on the value of nuclear power as valid when it accords with yours and reject the validity of an opinion on the validity of CC from the same scientist (Barry) . How come people are not credible when they have a different opinion to yours – oh, I forgot you are always right aren’t you? Qatar will need all that nuclear generated electricity to power the stadium air conditioning units it promises for the 2022 FIFA World Cup, so let’s hope there are no delays beyond the 2020 commissioning. Seriously though this is a telling comparison. And reading about the future of Egyptian natural gas supplies up through the western Mediterranean – Israel, Lebanon, Jordan, Syria and Turkey – you could be excused for not blaming these nations to envy the Gulf States and their nuclear choice. But what would the US say? And would Australia supply them with uranium fuel? U.S. is helping out with the UAE as I understand it — via NRC facilitated certification. They are also open to full IAEA inspections and have signed the NPT, so Australia should have no problem selling them uranium. You’re a joke mate. Grow up and learn to respect your betters. his publication list is here. Garnaut is the Chairman of the International Food Policy Research Institute (since 2006) and a member of the Trilateral Commission. He is also Chairman of the Papua New Guinea Sustainable Development Program and Chairman of Lihir Gold Limited. Sure it’s credentialism, but if you could demonstrate one hundredth of his achievement in the field I might perhaps consider listening to your economic opinions. Consider the chance that you’re more likely to be a bitter old loon ranting on the web rather than an undiscovered genius talent for economics who missed his first calling. Hmmm, ockham’s razor, which one do I guess you are? You’re a joke yourself …, and rude …, and arrogant …, and gullible! Your first star point is all you need. * Senior Economic Adviser to Prime Minister Bob Hawke. Garnaut is not impartial. He is a hired ‘gun’ (consultant), paid to give Labor the answer they can trust him to give them. Ask yourself, why did Labor choose Garnaut to do the job? By the way, Bob Hawke’s Government, with Garnaut as the Senior Economic Adviser, was the one that prevented consideration of nuclear power by the Australian bureaucracy, effectively prevented progress in nuclear in Australia for another 20 years, and extended that ban on nuclear by a further 20 years from when they started it in the first place (remember Gough Whitlam and Dr Jim Cairns, et al). And you want to take notice of the pollicies he suggests. You’re the joke! I should point out for those who didn’t make the connection, by preventing the implementation of nuclear power in Australia, the Bob Hawke government, in which Ross Garnaut was senior economic adviser to the PM, has caused Australia’s CO2 emissions to be in the order of 10% to 20% higher than they would be now if we had proceeded with nuclear. If Labor had not opposed nuclear since the 1960’s and made it politically impossible to proceed with it, Australia’s emissions would be lower still. Peter Lang – I am often wrong – for instance I was totally anti-nuclear power from my youth – even to the point of attending anti-nuke marches. However, I am willing to listen and learn and change my mind when the facts are explained by scientific research, or when circumstances, events, happenings occur which prove me to have been misled or to have misunderstood the problem. I merely suggest that you, likewise, open your mind to the possibility that you may be wrong on some of your prejudices and perceptions. It can be quite liberating. It should be noted that this latter effect is not yet confirmed, but studies with voles near Sellafield, and lower than expected deaths from Chernobyl suggest it is likely. Arrogant, coming from you! ha! This is a person who’s such an unrestructed genius, that with nothing more than his own “common sense” is prepared to go against all economic orthodoxy. And back up his arguments with nothing. I call crank. Peter, I think the *original* point about the UAE not having a carbon incentive to go nuclear was misunderstood by you. The fact is that they *chose* nuclear even *without* a carbon-tax. That’s the bigger point here, not the ins and outs, good or bad, of a carbon tax (as you know, I’m a left-socialist and *oppose* the carbon tax as well). The point of the article is that the UAE is building nukes over oil and gas…over gas largely so they can sell it to Europe and Japan, one of the bigger incentives the Russians have openly admitted as well. But also..not really mentioned…is that the Greenies should take note, the UAE also chose nuclear over *solar*, and they do have a lot of solar, do they not? Additionally they chose nuclear via an objective process uninfluenced by the “Vast Money Driven Nuclear-Inustrial Complex Lobby”… ‘cuz there is none there. This is why the decission of the UAE is so important. Very well summed up David. It would indeed be interesting to hear the comments from the Diesendorfs and Bob Browns of this world on this. I agree with you, entirely (I think, unless I’ve missed something). Perhaps my message got lost in responding to subsequent comments. So, I don’t agree I missed the original point. The fact is that they *chose* nuclear even *without* a carbon-tax. Yes they did. And they made the decision on a rational basis. That is, they project that the LCOE of nuclear, its security of supply for the long term, and its safety makes it a better choice than oil, gas, coal, solar or any other renewable energy option. What is really important is that it won out, on cost, in the region with the most abundant and low cost oil and gas on the planet. If nuclear can be the economically rational choice in that situation, than it can in Australia too, if …. In other words, how can we remove the impediments that would prevent us getting low-cost nuclear in Australia. Clearly, we must remove the impediments before we impose carbon pricing because if we don’t the issue will never be addressed properly. It will be burried. We will ratchet up the cost of electricity in Australia, forever. That will disadvantage Australia, forever. Electricity is a fundamental input to everything. The threat of union activism, created by this sort of trouble making, is a major contributor to the investor risk premium. It is the threat of union distruption, and political activism against nuclear at any time during construction and throughout the life of the plant, that makes the projected cost of nuclear in Australia so high. This is just one of many examples of the threats reinvigorated unionism is creating for business in Australia (and especially for a new and unpopular industry like nuclear). This is a result of the Labor government rolling back the Industrial Relations reforms of the past 25 years. We are back to the ‘us versus them’, ‘workers versus bosses’ ideological driven fights that caused so much damage to Australia’s economy in the 1970’s and 1980’s. How can Australia remove these sorts of impediments. Surely, if the threat of climate change is as catastrophic as most BNCers believe, then it is imperative that the very people arguing to stop climate change should be arguing to remove the bad policies that are causing the investor risk premium on nulcear to be excessive. It is this and many similar bad policies that cause the projected cost of nuclear in Australia to be more than twice the cost of new coal in Australia, yet UAE, in the heart of the cheapest oil and gas in the world, can have nuclear at lower cost than fossil fuels (LCOE which means whole of life cost). I suggest, BNCers don’t want to discuss this because they would have to admit the obvious facts, this would mean they have to challenge their fundamental idelogical beliefs. Ziggy Switkowski suggested that the Gippsland Coast of Victoria could be the best place for the first NPP. He gave reasons, and I’d add that by putting the first NPPs in Victoria, we could replace our dirtiest coal fired power stations sooner. So I agree, Victoria could be the best place for the first. However, knowing how Australian states like to compete to be able to claim first and best at everything, I’d suggest we need to encourage the states to compete to get the first Australian NPP built in their state. NSW and Queensland need new base load generation capacity. South Australia needs to provide Olympic Dam mine with reliable electricity supply and water from desalination. South Australia is also where our submarines are built and maintained and I imagine it is inevitable that Australia will have to change from diesel to nuclear powered subs sometime, so Adelaide would seem the logical place for their maintenance. And the National Government controls Jervis Bay so it can threaten to build the first one at Jervis Bay if the states can’t get their act together fast enough. I think it more logical that rather than the first single NPP, we should be considering the location of the first four. Four plants under simultaneous construction during our first build, and six thereafter, until we match France with our proportional nuclear mix, and indeed, surpass her. Yes, I meant that. NPP to me means nuclear power plant, or nuclear power station of up to 8 units like Pickering and Bruce in Ontatio Canada. We can build multi-unit plants in NSW, Victoria, SA and Qld at the same time. I expect it is quite likely we would start building a second multi unit site in each state before we had completed the first in each state. Further to that comment, the fact that any site will have multi-units on the site, is one of the main reasons I do not believe Ceduna will be an economically viable site. It is too far from the Adelaide load centre, and Olympic Dam si and will always be a far too variable load centre to justify an NPP. Furthermore, mines are not a long term reliable load because they get shut down from time to time (mine failures, market retrenches and mining is cut back, perhaps even mothballed from time to time). Just to address Peter’s concern about unionization. The problem Peter poises is a strictly *private* investment scenario…where pro-nuclear advocates after to go chasing after private investors wishing to see a return on their dollar. The paradigm of private investement is only a concern if there is not a strong state intervention. Thus, it is appears Peter approaches this issue from his libertarian ideological perspective while charging that others need to ‘let go’ of theirs. This is the reason BNCers generally don’t want to discuss the specific issue of unionization as it’s different in different parts of the world. Clearly the UAE scenario, of which Barry’s entry is the subject, is interesting at several levels, then, beyond what he (and I briefly thought important to mention) noted about their choice. And on what was stated we agree and, certainly Peter and I agree on the Carbon Tax issue as well, albeit from different ideological and economic vantage points. S. Korea, or the “Republic of Korea” (ROK) as it’s officially known, is has built and runs many nuclear power plants. They are in the process of building and brining online soon the kind of reactors that will be built in the UAE. Peter, and others, should note that the ROK probably has the most militant unions in the entire hemisphere, more than Japan, or, for that matter, Australia. The Confederation of Korean Workers is a left-wing, militant split from the official, corporatist ‘union’, the Korean Federation of Workers. Wanna guess which union represents the workers building nuclear plants? If it’s very true that what Peter says that Australia’s 25 year history of anti-union legislation is being reversed, I’m over joyed. What is really need is a reversal of it’s privatization of energy so real state investement can be made. But that’s adding gasoline to the fire here, so we probably can let that one go. But a unionized work force (for building and operations) *eqaulizes* the risks across generation…that is unionization does not make nuclear *more* expensive than coal. In act since *both* types of generation can be, and should be built with 100% unionized work forces, it makes *no difference* what so ever at least at that level. The problem with non-unionization is that it lets the bosses off the hook for short cuts. The idea of living near a non-union built power plant should give anyone pause, to tell the truth. Unions have their own forms of safety committee and inspections that double what exists from the regulatory environment. This is why unionized coal mines have fewer cave ins, fewer safety issues than non-union mines. Having no unions or very weak ones puts any country at the same level as, say, Malaysia or Uganda. The race to the *bottom* is not the measure by which investments should be made. It’s the race to the *top* with increasing wages and standard of livings. But back to the UAE. The other interesting aspect of the deal is that the *extremely* heavy *state* investment and guarantee for the project, worked out with the consortium of ROK companies, a good half of which are *state owned* to begin with. So the ‘hit piece’ Peter did on unions was sort of uncalled for…if, one assumes, that the state will play a large role in the financing of the project. Remember, the French system we all laud is a fully *socialist* one, built and operated by a 100% unionized work force (CGT and FO-CGT). I’m heading off shortly for a bush ramble in Tasmania with some visitors who lived on the SA west coast and we have talked about Ceduna and Olympic Dam. It seems logical to combine water cooling of NP with desalination. The desal at Whyalla about 285 km from OD won’t go ahead. The port of Thevenard near Ceduna will be deepened to take ships loading zircon and monazite, a thorium ore. Looking at Google Earth a water pipe from Ceduna to OD may be over 300km long but that is still shorter than the pipe from the River Murray to Woomera which is close to OD. If the talked about HVDC link joining the WA and east Australian grids ever materialises then a multi unit NPP at Ceduna makes sense. I wonder perhaps if transmission could be built up in stages, from Ceduna to OD and Pt Augusta then later across to Norseman WA. The money’s there, just cut the NBN in half. Australia does have a history of union anti-nuclear activism, although with pro-nuclear Paul Howes now National Secretary of the influential AWU, there may be more cause for hope in the future. I would be more comfortable with the prospects for nuclear power in Australia if there was some legislation specifically addressing the threat of worksite bans, blockades and boycotts of potential nuclear power projects. There was widespread union action against uranium exports in the past. It’s the sort of thing which could drive the cost of a new nuclear build through the roof. It needs to be addressed. I still don’t understand what you mean by this. I, and I suspect all other BNC regulars, support low-cost nuclear power. I support removal of unfair, draconian and biased anti-nuclear regulations. I want us to do this as efficiently as possible. I believe there is a joint role for government, unions and the private sector in this. What exactly are we not discussing??? Yes, Paul Howes is a strong supporter of nuclear. But, he, by his recent declaration of war on one of Australia’s largest companies, and similar declarations by other union leaders (eg MWU tying up our ports and exports), demonstrates the effect of Julia Gillard’s winding back of 25 years of Industrial Relations reforms. I don’t have to spell it out. That sends a clear message to investors that investment in a long life asset like nuclear would be a very high financial risk. This is one of the main reasons that the projected cost for nuclear in Australia (and USA and other western democracies) is far higher than it could and would be if we removed this impediment. You ask “what aren’t we discussing?” about removing the impediments to low cost nuclear. Well I’ve laid that out in many comments on the “Alternative to Carbon Pricing” thread and I’ve even provided, several times, a link to a comment where the most relevant comments are listed linked in the suggested order to assimilate the whole message; and then make a constructive contribution. 2. Then a lead article suggesting what the outcome of such a study might be. I was not suggesting a commissioned report, nor a full analysis. I was not suggesting that you request a paid contribution, just an article like any other lead article. I am just suggesting asking a person who has understanding of how this is done to impart their wisdom to BNCers. 3. In the meantime, I was trying to lead BNCers, with the lead article and comments on the “Alternative to Carbon Pricing” thread to brainstorm and develop a list of what are the impediments to low cost nuclear. I provided some suggestions, but there has been very little discussion of this subject. Not only on that thread but anywhere else I’ve posted on that subject. IR is one of the impediments, but clearly from the comments above this is not one people here would like to see on the list. And therein lies the problem. People simply want a carbon price, thinking that is going to solve the emissions problem and we can avoid tackling the real issue – which is removing the impediments to low cost nuclear. Others are: regulatory impediments to business (which will be magnified for nuclear), tax and other advantages for renewables and fossil fuels, and many more listed on the other thread. But I am not suggesting we just write paragraphs with words. I am suggesting a brainstorm to produce a list of actual impediments, referenced, and subsequently quantified. (for example: Pink bats home insulation program if it had succeeded would have cost $200/tonne CO2 avoided; much more expensive if done by individuals, so this is a very high hanging fruit, no a low hanging fruit as the Greens would like us to believe). I can’t make such a list on my own. It needs the combined efforts of people with different knowledge and skills. We brainstormed and produced some good material in the lead up to the Martin and Lang article on ZCA2020-Critique. I am suggesting we do something similar again, over a series of posts. But I don’t see much point in me leading that. Few are interested, so it becomes all about refuting what I offer and next to no positive contribution. I, and I suspect all other BNC regulars, support low-cost nuclear power. I support removal of unfair, draconian and biased anti-nuclear regulations. I want us to do this as efficiently as possible. I believe there is a joint role for government, unions and the private sector in this. That’s just a motherhood statement (something you chastised me for in a previous comment about this very subject). What are the details of the actual impediments to low cost nuclear? If they were removed how much would they reduce the LCOE of nuclear? And what policies would be the best way to remove them? You have produced a detailed TCASE series on energy and many of the comments on BNC go into excruciating detail about chemistry and physics of nuclear energy, waste, radiation, etc. This is all excellent and interesting. But I suggest it is missing what we really should be focusing on right now. Which is: how can we get nuclear in Australia as soon as possible? If we want to achieve that, and want to have policies with broad support, we need to get nuclear at a cost that will not inflate electricity prices and will not damage our economy. (A carbon price will damage our economy and probably by much more that Treasury, Garnaut and others are admitting). The paradigm of private investment is only a concern if there is not a strong state intervention. That is absolutely not correct. In fact their effectiveness at disruption is probably even worse in a public sector organisation. I can tell you horror stories about what the unions go up to on the BC Hydro projects and they’ve crippled the NSW electricity industry. On our wharves, the unions dropped shipping containers and much more when told to by the union leaders. Always on the pretext of safety (or insufficient ice cream flavours in the canteen). Once union control of our wharves (our imports and exports) was removed, the productivity of the wharves doubled. Translate the effect of that to the construction and operation of an NPP and you can double the cost of electricity from the NPP. These are the sorts of issues I am urging BNCers to face up to. We need to list the impediments to low cost nuclear. Burying the issue under a carbon price does not achieve anything. It is simply hiding it, raising the cost of electricity hugely and unnecessarily and delaying the date it has to be addressed. I suggested here https://bravenewclimate.com/2010/01/31/alternative-to-cprs/#comment-109491 how that might be accomplished in Australia. Thirdly, the remainder of my previous post was in response to your claim that unions can reduce the cost of construction and operation of an NPP. To that I say: BS. However, this is side tracking. It is just one issue that needs to be on the list we get from brain storming. Once we have the list than we can quantify the effect of each, and then make decisions about what we’d need to do to get nuclear cheaper than coal in Australia. As and engineer, I would think you would support the approach of doing a proper options analysis. That has not been done yet. We are locked into a path of carbon pricing. There are many agendas behind this, but we are being rammed into a decisions without having done the proper options analysis. True, but then I’m not the one proposing this as a central focus of activity. This is because I think it is just one element of the issue, and not necessarily the most important one. Nor am I the one labeling other people who don’t choose to comment on it as ideologues, as you regularly are wont to do. I reiterate: not commenting on something indicates nothing more than one hasn’t anything useful to say on the matter — or at least anything further compared to what has already been said. Peter, my distaste is for your consistent criticism of the silent BNC majority on this matter as left-wing political ‘blind monkeys’. You have no basis for this assertion other than a personal viewpoint/interpretation, which I think is unhelpful and, for many, offensive. To be honest, this particular issue has been hammered so endlessly for such little productive yield that it’s got to the point where I’m bored out of my mind with it (to put it politely!). Further, despite your 100s of comments on this matter, you’ve still not convinced me that a carbon price isn’t a useful step in tackling this issue (in combination with other measures). And so, I’ll keep advocating for a carbon tax or fee-and-dividend. Taking all this into account, there is little wonder that I, or many of the other regular commenters, are not bothering to engage with this matter further. We have other fish to fry, but I’m happy to let you cook your meal too, as long as it doesn’t continue to be your raison d’etre for commenting on ever single nuclear-related thread on this blog. Maybe you should be asking other well-read and more politically-oriented blogs, such as Catallaxy Files or Lavartus Prodeo, to run with this instead? I honestly don’t think that BNC can, or should, do what you are requesting. And finally, surely you have more to say than just this? A little more than a year ago, you were never mentioning it, and had lots of interesting things to say. Now it’s all you ever seem to talk about. Which is a shame. 1. If Australia cuts emissions by 20% be 2020 how much difference will it make to the temperature? (answer in deg C). 2. How much would it cost the average adult Australian? Note: I am familiar with the McKenzie chart. It shows insulation in buildings to have a negative cost. However, it is estimated the government run Pink Bats home insulation program would have cost $200/tonne CO2 avoided if it had run as planned. However it was a total fiasco so the cost per tonne avoided maybe around twice this amount. For private individuals to implement retrofit insulation would cost even more. The point is that what the McKinsey report thought would be the lowest of the low hanging fruit was actually very high hanging fruit. So lets get a bit more realistic and get good data before we go down the past of pricing carbon while avoiding doing a proper analysis of the alternative – removing the impediments to low-cost nuclear. No such analysis has been done yet. What exactly are we not discussing??? What would we have to do to get nuclear in Australia at a cost less than new coal or somethjing similar. I just read your latest comment. I hear you don’t want to deal with this and its your blog site so I must abide by your agenda. you’ve still not convinced me that a carbon price isn’t a useful step in tackling this issue (in combination with other measures). And so, I’ll keep advocating for a carbon tax or fee-and-dividend. I am surprised that being objective, you would argue to impose an economy damaging carbon price (everyone agrees it is) without wanting to know what the alternatives are. Treasury can’t do the analysis because it is against government policy . there is no industry in Australia to push for it. The Gas and Renewable industries have the BCA sown up. There is no one to investigate this other than a group lie BNC who has become persuaded that nuclear is the least cost option – if we removed the impediments to low cost nuclear. But you are resisting determining what they are or waht the magnitude oif them is. I’ve posted several comments on the other thread explaing why we need to remove the impediments to nuclear before we impose a carbon price. Saying we’ll do both together is just lie what the Renewable industry says “we need all options” but dont fund nuclear. Barry: I am disappointed by you, as this has been a very constructive thread. Peter Lang is right, nuclear does not need a carbon tax if the blanket ALP/Green ban is removed. You seem not to have the guts to admit that, is it for fear of offending your mates in DCC? As it happens, I am not wholly enthused by nuclear as it does not have any of the enormous social benefits of the emissions of CO2 and H2O from combustion of fossil fuels, both of which generate higher yields from agriculture, forestry, and fisheries, as some 1000+per reviewed papers testify. Google Graham Farquhar’s (of ANU) papers for starters. BTW, I bet you cannot as you read this, without looking it up, tell me what the formula for combustion of fossil fuels is. Be honest! And I also bet you cannot even when you have looked it up tell me what are the respective radiative forcings of the H2O and CO2 emissions from combustion of hydrocarbon fuels. I further bet that like ALL climate scientists you are not even aware that fossil fuels are hydrocarbons that can only combust in the presence of oxygen, and that they unavoidably produce both CO2 and H2O. It is even more obvious that you do not know that a carbon tax is necessarily a tax on water vapour (aka H2O) . So you and your fellow travellers in DCC (how much did you get in ARC grants over the last 3 years, I know, but you will never admit it) want to tax both CO2 and water. Hey, let’s have a rain tax! For duplicity you have few equals. *Yawn* How very tedious and unoriginal, Fred. If it isn’t obvious enough, nuclear power will never, ever happen in Australia or most other countries without a carbon tax (or similar) or some form of government support – because it is uneconomic. As it is, FOAK Nuclear has a LCOE that is significantly higher than that of coal and gas, approximately on par with that of onshore wind energy (excluding integration issues) actually, only nuclear is far more risky, the capital costs of nuclear are way higher due to reactor size, and it will take far longer to build each reactor. In other words, new nuclear is completely and utterly dependent on government support, inferior in most ways (excluding integration which isn’t a problem AT ALL at the moment) to much hated (by you) wind energy. Even if the FOAK and risk premiums are eliminated, the LCOE is at best equal or slightly higher than that of coal or gas. Coal and gas still have the advantage because they can be built on a far shorter time scale, are far less risky, and have capital costs that are less than half that of any form of nuclear. Without government mandates or taxes on dirty energy, nuclear will never, ever, happen in a country has a massive amount of coal and gas, like Australia. The only reason nuclear was implemented in France the way it was, was because of the government saying that it was how it would be. Peter Lang keeps claiming how much cheaper Nuclear would be if all the unnecessary impediments to low-cost nuclear are removed. While I agree that unnecessary impediments need to be removed, there is absolutely no evidence this will actually make nuclear competitive. It is no panacea. At best, NOAK nuclear has a LCOE equal to or slightly higher than that of coal or gas, the only exceptions are where coal or gas are expensive (like some areas of the US where nuclear plants are proposed). The cost of Nuclear is often pointed out to be $2/watt as in China, but this is completely irrelevant because they also build coal plants significantly cheaper than we do too. Actually, last time I checked they build coal plants cheaper than the west does to a greater degree than they build nuclear plants cheaper. They build everything cheaper than we do. Same with UAE. Same with Korea. The cost of Nuclear in France did not decrease over time in France, it increased, by the way. Where is the evidence that merely removing impediments will make nuclear cheaper than coal? It hasn’t happened in any country, hence there is none, at all, it is merely the same faith based reasoning that many renewable proponents rely on. The only way to possibly implement nuclear in Australia is to not only remove all impediments, but to pick favorites via a government support, or by inflating the price of coal and gas. So which will it be? It can’t be neither, because that means no nuclear and only gas gas gas and more gas. If this is what you want then go ahead and say it. I’m fairly sure I’ve seen Peter Lang advocate internalizing external costs of electricity. This is interesting, because according to his own “authorities” source, ExternE, external costs for lignite amount of 6 euro-cents per kilowatt hour (in 2005), the largest share, 40%, is in greenhouse gas emissions. So does this mean you’re for a carbon tax as long as it isn’t called what it is? FK demonstrates that a little knowledge can be a dangerous and self-deceiving thing, creating imaginary pinnacles from the summits of which one can sneer at one’s betters. Well, now, that would depend on which fossil fuel we were talking about. What about coal? That’s almost straight carbon. C + O2 -> CO2 . Not a lot of H2O. Natural gas is mostly methane. CH4 + 3O2 -> CO2 + 2H2O . That does produce water. Oil contains other hydrocarbons, which also produce H2O and CO2 on combustion. This is all basic high-school chemistry. The thing is, though, there’s something called the Water Cycle. This means that, unlike CO2, excess water vapour condenses out as rain or snow. The moisture turnover with evaporation, condensation, and precipitation is self-regulating over a period of days and weeks, unlike the CO2 cycle which has periods measured in decades or centuries. The amount of combustion-produced H2O vapour is utterly insignificant compared to the daily evaporation from the oceans. Therefore, the “respective radiative forcings of the H2O and CO2 emissions from combustion of hydrocarbon fuels” are; insignificant, and highly significant, respectively. The increase in CO2 has, however, increased global average temperature, which means that there is more evaporation and hence more H2O in the atmosphere because of the CO2. Since H2O is also a greenhouse gas, this amplifies the temperature increase. Rain tax accusations are therefore wide of the mark. Yeah and I’m sure you read all of them. Let me guess… like so many other idiotic climate-deniers you merely visited a data-mine or a quote mine, and then claimed that they all support your point of view? Really? Is that why we don’t use jet-engines in space? As far as the rest goes, just a bunch of the usual attacks from some douche who once again proved John Gabriel’s Greater Internet Theory. Peter, what I claimed was not that unionization is cheaper, but rather it levels the costs of labor across platforms. Thus, building a coal plant with union labor, per unit of man-hours is the same, obviously, with nuclear. That was my only point. The UAE will be building their Korean designed nukes with non-unin labor. Why? Because they kill off their trade union organizers, use foreign labor and otherwise have little or no labor rights, period. This might change under the impact of the ongoing Arab Revolution, we will have to see. But Korea, the US and Japan do not have problems with union labor. My point is that it would be a major jump in political stupidity for pro-nuclear activists to side with those that oppose the rights of those that actually *do the work*. Generally a union neutral or pro-union position is considered best. We also want to project to any society that nuclear offers better wages and working conditions, not *worse* as what happened with Aussie’s Wharfies. That some unions are opposed to nuclear energy is unfortunate, and only means we have to convince trade unionists of the positive aspects of nuclear energy *for them directly*. Peter is right for his concern that it is, at the end of the day, the cost of nuclear energy that will make or break it as THE source of energy for our planets future. On the Social-Media list on nuclear run by Dan Yurman, of Idaho Samizdat, the issue of urainium supplies has cropped up as it may well be the bigger factor short of Gen IV reactors (LFTR, etc)., and not costs. We will see. I think Barry ought to entertain a thread on Chinese nuclear as they are now up to 27 new builds under way and dozens more between now and 2015. If it isn’t obvious enough, nuclear power will never, ever happen in Australia or most other countries without a carbon tax (or similar) or some form of government support – because it is uneconomic. If that was true, why has UAE decided to go nuclear? Furthermore, how high would the carbon price have to be to give nuclear an economic advantage over gas? I feel I am being asked to back off on this issue, so I can’t say much. Please answer my two questions with figures and provide links to the sources you’ve used. but rather it levels the costs of labor across platforms. It may level the cost if we force all industries to be fully unionised. But doing so raises the cost of everything, enormously, because of the organised disruption the unions cause. Examples were the petrol strikes in Australia, the coal miners strikes in UK the electricity strikes in UK and Australia. Union activism and disruption is ramping up again in Australia with the Maritime Workers Union conducting rolling strikes on our wharves and Australian Workers Union declaring war on our large mining companies. If we want low cost nuclear, then Industrial Relations is one example of the sorts of impediments to low cost nuclear we need to address. If we can’t face it, we must accept that we will have gas and a very high carbon price which will cause serious damage to the economy and, therefore, to everyone. Sorry, I can’t keep going on this. I have to let it go, as you will understand. I accept much of your criticism, and I understand policy and the economic consequences of them, is not your primary interest. I understand you are bored with the discussion about carbon pricing. But you’d have to admit, it is an important argument about what will establish Australia’s policy for a long time ahead. Get this wrong and it will be very damaging in all ways, not just to the economy. We’ve made very bad decisions in the past, based on similar types of arguments as those being used to argue for a carbon price. You were prepared to challenge your beliefs about nuclear power but have not been prepared to do the same on carbon pricing policy. If someone else made a statement like this (in the past you’ve called it a vacuous statement), you’d rightly jump all over them. I’ve posted the argument against carbon pricing (before we remove the impediments to low cost nuclear) in many comments on the “Alternative to Carbon Pricing” thread. Most of these posts have not been challenged and certainly not refuted. Therefore, from my perspective, they stand as persuasive. Consider again your statement quoted above. You’d jump all over me if I made an equivalent statement, such as “I am not persuaded that warming, by just 1% over 100 years, can cause a catastrophe, especially given that life thrives when the planet is warmer and struggles when colder”. By the way, just to be clear, I am not opposed to cutting emissions. In fact I am strongly supportive of getting more secure and sustainable energy supply. But I am opposed to implementing bad policies without proper due dilligence investigation before we commit to hundeds of trillions of dollars of expenditures (world), on what could be a really ill conceived way to achieve the goals we want to achieve. There are other alternatives, and we are not even willing to investigate them. That is negligent and is not an objective approach. Watching SA Premier Rann open yet another wind farm I’m not confident nuclear will get up at the ALP conference. Renewable energy seems to be a kind of Age of Aquarius thing with senior politicians. Never mind the permanent subsidies and standby gas turbines; it’s the decent thing to do. Notice in another link Rann defends wind farm health isssues, not whether it is a cost effective form of low carbon electricity. I fear Howes and Ferguson will lose the moral superiority battle to Rann and his ilk. BB: Congrats on posting my last, if I had thought you would I would not have been so rude, and I apologise. However I would really be grateful if you could point me to where my main comments are “unoriginal”. Truly so far as I can see there is nowhere in IPCC AR 4 WG1 where emissions of water vapour through combustion of fossil fuels are quantified, least of all in comparison with increasing water vapour allegedly generated by rising temperatures of less than 1 0C since 1900. I can well imagine your off the cuff comment was in response to my rudeness, so again I apologise, especially as I know from your stance on nuclear energy that you are a decent chap. But seriously, where in the main literature on AGW is there any serious analysis of ALL emissions from fossil fuel burning? How very tedious of the ever-nuclear-energetic Ziggy Stardust. I’ve read through this thread a number of times hoping that someone would have spotted the likely prime motivation for the UAE. If you have product in the ground you can export for $100/widget (oil/gas) and you can generate electricity from an imported source for $50/widget, what would you do? The concept is opportunity cost. It’s the same reason some oil/gas rich South/Central American countries are either encouraging or investigating switching vehicle fleets to CNG. Infrastructure wise crude is easier for them to export than natgas. Why not get the windfall profit from oil export and use the natgas domestically? The UAE’s actions are the same as Australia saying; we shouldn’t burn our coal, because we can export it all for 10 times the price and install a few NPPs for 4 times the cost of coal-powered electricity. The electricity is still much dearer from the end users point-of-view. Nuclear fails again. The roof-top solar industry would love it, BTW. A very unusual claim. Would you mind backing up this with some evidence? … install a few NPPs for 4 times the cost of coal-powered electricity. The electricity is still much dearer from the end users point-of-view. Nuclear fails again. Although you are exaggerating a little by saying nuclear would be 4 times the cost of coal powered electricity, your point is correct, IF we are going to follow the policies that are currently proposed. Instead of priciing carbon (yet) we need to address and remove the impediments that would prevent nuclear being cheaper than coal. Our government has not investigated the alternative to a carbon price; i.e. remove the impediments to low-cost nuclear power. It is neglient that they have not done so. Therefore, we do not have any idea how low cost nuclear could be and how the economy could be improved by removing the many impediments that would prevent us having low-cost nuclear power. We do know that renewables are very high cost and totally uneconomic – far higher cost than nuclear and they cannot provide a reliable power supply. Unusual? Are you going to suggest you are not consistently anti-geothermal, dismissive even (Cooper Basin particularly) while pro subsidy for an Australian NPP? 1. How many kilowatt hours have been produced by Cooper Basin geothermal? 2. Can you provide even one reference to back up your claim about Barry being anti-geothermal, let alone consistently? I think you would be one of the loudest critics of Geodynamics. Most recently you didn’t miss the opportunity to ‘diss them again. Was it ABC Radio? Why not put your sizeable talent to solving EGS’ needs rather than chasing the 1950s “too cheap to meter” nonsense? You mean on Counterpoint? I said HDR was not commercialized and had not yet delivered an electron of electricity to any grid anywhere in the world, and therefore couldn’t be considered alongside Gen III nuclear. This was when I was discussing my co-authored Energy paper – we said the same thing there, and the referees had no problem with this. This was in response to a question put to me on this point. What part of this statement is in error, or ‘anti-geothermal’? How about you stop hiding behind your pseudonym, respond to questions directed at you, and stop making false-statements about Brook elsewhere? Brook said that hot rock geothermal is not commercialized, there’s no hot rock geothermal commercial power plant running anywhere in the world and that we just can’t say what the costs will be. All of which is correct. So which part do you disagree with? What part is dismissive? And who said anything about “too cheap to meter”? Is that a straw-man? Oh, and where have I ever asked for a subsidy for nuclear, other than a carbon price, which would be technology neutral? What is Scott a pseudonym for? Please. There are operating EGS plants in both France and Germany. The French and German efforts are intended to produce small, easily installable plant. So on your own admission (like Stardust’s) an Australian NPP is uneconomical otherwise? You haven’t asked for Government R&D efforts for GenIV? By advocating NPP for Australia aren’t you (by definition) asking for a Government contribution? No private entity will build and operate one in Australia. As in the USA, no-one can make the economic case otherwise. I see no-one will touch my theory on why the UAE is going nuclear. If I’m right, it says absolutely nothing about nuclear as an economic energy source. Under current conditions in Australia, yes. Coal here is very cheap. Either a carbon price is needed, or a decision to go nuclear at lowest cost (as Peter Lang advocates), or both. By advocating NPP for Australia aren’t you (by definition) asking for a Government contribution? I’m not advocating for Gen IV R&D here, no. If it happens, great, but the commercial demonstration of the IFR and associated fuel cycle, or a LFTR, or whatever, should ideally be an international effort, and that is where my efforts, such as through SCGI, are focused. If Australia is looking to commission its first nuclear power plants here within the next decade or so, it will build Gen III. This should be treated fairly and equally so as to compete against all alternatives (geothermal, wind, solar, wave, etc.) on the same terms. There are operating EGS plants in both France and Germany. There are HDR and EGS systems currently being developed and tested in France, Australia, Japan, Germany, the U.S. and Switzerland. The largest EGS project in the world is a 25 megawatt demonstration plant currently being developed in the Cooper Basin, Australia. No commercial systems. No electricity to the grid. ‘Your’ UAE theory is hardly novel. I don’t know any analyst who doesn’t think a prime motivation for them is to sell their gas on the international LNG market rather than burning it in power stations domestically. Your point is?? That nuclear is cheaper than gas for baseload electricity, and that the UAE chose nuclear instead of solar? Well, they’re good points! I’ve been onsite at Landau in Der Pfalz and it is most definitely delivering power to the grid commercially. No, that’s the opposite of my point. They can export the oil and gas instead for a windfall return, preserve their 15-30 years of export income. Electricity prices will be going up in the UAE, but they will have a greater income from exports. It’s an opportunistic way to profit from the rest of the world’s fossil fuel addiction. Stardust would have it that we should believe it is a direct ENDORSEMENT of NPP. But in that case, why did the UAE choose nuclear power as opposed to another option? Why not solar-thermal, or coal? For my part, I have great doubts that nuclear power will prove to be as expensive in Australia as sometimes claimed. Even if it is, we would do well to subsidise some of the up-front costs and shorten the journey to full amortisation with the marvelously cheap power we could then enjoy. My objections to nuclear are made abundantly clear in this article; a (non-democratic) country decides today that they will go nuclear. The schedule has all 4 reactors finished by 2020. Most estimates I’ve seen claim about 8-10 years before the installation achieves carbon payback, so that’s at least 2028 before they are making a positive contribution to climate change. What are we going to do between now and then? Nuclear might have a role in Australia in the 2050 scenario, but we _really_ need to lower our emissions before 2020. Nuclear CAN NOT help do that. There’s no way to spin it. Evcricket, where are you getting those estimates from? My understanding is that nuclear has exceedingly low lifetime CO2 emissions, so low that your 8-10 year figure seems very doubtful. What are your sources? You also haven’t factored in the coal which we would avoid burning as soon as the plants went into action. By ignoring nuclear power to this point we have frankly missed any opportunity for seriously reducing our CO2 output by 2020, but if a decision in favour of nuclear power is made soon, we can start enjoying major CO2 reductions shortly after that time. It’s no use crying over spilled milk. We have to work with the situation we’re in. No no Finrod, I know the lifetime emissions are low, but note they are extremely dependent on mining and transport emissions. I’m referring to the embodied carbon from construction. From site works, cement production and other materials, there are a lot of emissions in the construction phase of a nuclear plant. There’s a lot of material required to contain a small, ongoing nuclear reaction. The emissions from creating these materials need to be offset in the future of the plant before the plant is making a positive contribution. page 11 of the pdf onwards. Something else pointed out to me by an economist friend in the building is the value to the UAE of protecting their fossil reserves. Apols if this has been covered above, but a quick skim revealed nothing. Their economic fundamentals are quite different from ours; the UAE moves away from fossil generation by building nuclear which will be ready in 2020. What do you reckon the value of oil will be in 2020? It’s cold hard economics for them and a choice between renewables, nuclear and imported coal etc. No mention either of the future fuel supply risks? I don’t think they have endogenous uranium deposits, therefore all energy is imported. It’s pretty committing in that region, which could be beset by war again in the future, to rely on imported fuel for one’s power generation. I guess they can always fall back on their fossil fuels. Lastly, well done to those above talking about desal as a means of not quite peaking control but definitely overnight load use. I’d wondered how load following could be achieved with nuclear and always assumed massive grid-storage would be required, but if desal water is required then there’s your answer. The trouble with load switching from the grid to RO desalination is that in a wet year you may not need the water. That water could also be shifted to elevated tanks as a kind of prepayment on later pumping efforts. An additional use for surplus energy could be high pressure electrolysis of water. The oxygen could be vented and the hydrogen saved. However using the hydrogen in fuel cells has already been tried in a few places e.g. Stuart Island, Washington http://www.siei.org/ but the round trip efficiency is abysmal ~7%. It would be better to use surplus hydrogen to make synfuel when that becomes economic. You won’t be surprised to hear I’m with Finrod on this, Ev. Since the lifetime CO2 emissions of the alternatives are similar (wind) or worse (solar), and construction times to get to the required generation capacity would be similar, 2020 is a lost cause in any case, barring a WW2-level industrial retooling effort that I just can’t see happening. My main source for lifetime CO2 emissions is this meta-study by the UK Parliamentary Office of Science and Technology. By the way, I’ve looked at the EGS situation recently. I’m going to stick my head over the parapet and score a technical point to esquilax – Landau is selling power to the grid. However, Barry is also correct in that even its proponents describe it as a ‘demonstration’ project. Its capacity is all of 3 MW. As always, scale is the killer. There’s talk of expansion, but not much seems to be actually happening. See earlier posts above – EGS = Enhanced Geothermal Systems = Engineered Geothermal Systems = Hot Dry Rock. For some reason (quite possibly trying to associate with the successful Icelandic/NZ/Californian etc ‘natural’ geothermal energy generation) the industry seems to be moving towards the former terms and away from HDR in its terminology. Good source, cheers Mark, I guess the difference is build times. I’ll give them the benefit of the doubt, but suspect 9 years is unlikely to be met. Would definitely not be met in Australia. Like it or not, even if the Govt mandated nuclear today there would be huge public opposition and the planning phase alone would take years. There’s at least a chance we could get a few GW of solar or wind in in that time. Coal is easy; do you expect it will do anything other than climb in price? It’s fair to argue that (presently) the delivered cost of the UAE’s proposed nuclear electricity will remain fairly stable as the fuel cost is a low component (anything from 16-28% of operating cost – depending on study). Given the UAE almost certainly plans to keep CCGT handy for peaking, I would be extremely interested to see the study of solar thermal. I suspect it falls down mostly over land costs. A country that cynically puts in nuclear power to export high price oil/gas probably couldn’t be expected to have studied a renewable alternative. esquilax, on 23 February 2011 at 10:30 AM — Solar thermal has a LCOE of around 21 cents/kWh, much higher than all the altrnatives. Cynical? What’s so cynical about it? This appears to be an opportunistic emotive slur thrown against the positive qualities of nuclear power in the absence of any substantial base for rational criticism. I’m sure if solar-thermal had been viable, the UAE government could have made land available for its deployment, although your point about solar’s heavy land requirements is taken. Likewise, you are quite right about coal being likely to increase in price in the future. That goes for Australia as well, incidentally. I seem to recall that U of S study being discussed here before, some time ago now. Perhaps someone remembers it. Note the amount of concrete required for wind in particular as compared to nuclear for a given quantity of energy delivered. I’m not sure how this can be squared against the figures given in the report. Two widely-cited defects of nuclear power are construction costs, and waste. Let’s examine some aspects of these issues. which is much smaller than the fossil-fuel benchmark of 400 g CO2/kWh(e). The IPCC estimates that the total carbon intensity of nuclear power (including construction, fuel processing, and decommissioning) is less than 40 g CO2/kWh(e) (Sims et al., 2007). Please don’t get me wrong: I’m not trying to be pro-nuclear. I’m just pro-arithmetic. In sum, the whole ‘debate’ about nuclear power’s embodied emissions revolves around what people project future uranium ore grades will be, and that’s where the payback range of 2-14 years comes from. It’s not from the construction components. In that arena, nuclear wins hands down compared to renewables, which by their diffuse nature, require a LOT more materials on a energy-equivalence basis. That would be funny if it wasn’t so very sad. You think those damned Arabs are happy to squander a lazy $20 billion because they can’t be bothered studying all the alternatives? That’s right up there with ‘Truther’ theories. @Mark Duffett, @esquilax, I stand corrected, the German HDR geothermal operation is delivering electrons to the grid. But the point about demonstration vs commercial operation stands, and indeed it raises an interesting comparison. A whole range of sodium-cooled fast reactors also deliver electricity to the grid, some in large quantities (that includes Phenix and BN-350/BN-600). But they are not sufficiently widely deployed to be considered nth-of-a-kind commercial operations, so were not included in our Energy paper assessment. EGS is often also used as an acronym for ‘engineered geothermal systems’ because the aquifer must be engineered (artificially created), rather than using a natural one like conventional geothermal. Did they study the alternatives? I can’t find any information to suggest they did. My contact at Areva Renewable says they did not, again probably to do with very valuable land more than any other issue. Ev, you are correct in one sense…it comes down to their petroleum exports. But it’s not oil, it’s gas. Gas, which was routinely flared off is now collected and even at the low price it is now, the UAE understands the futures… the real price should be going up in few years and they want to export as much as possible and not waste i in CCGTs…which is what the Saudis decided to due about 10 to 15 years ago. The Saudis burn *oil* in their GTs (all Frame 7s are dual-fuel – gas or liquid designed). So…even the Saudis are now investigating LWRs and setting up their infrastructure around future increases in atomic energy. They, too, are not choosing solar (except, as in the UAE, some boutique forms of solar heating and cooling which do make sense for some residential needs). The Russians, I might add, have also decided in part to go for expanded nuclear to help in subsidizing the gas sales to the West. Again, better than coal, oil, wind or solar I think. Lastly, on uranium. This is the a long term debate which involves costs and energy per increase use of fission vs lower grades of ore. Of course, the more extractive industries use electricity the *less* carbon output there is since the CO2/CO % is based on diesel fuel usage for more remote mining locations. The more this is nuclearized, the less CO2…regardless of the falling % of usable U235. And then there is Gen IV/Fast Reactors which effecivetly multiply available fissionable material by at least 100 times. What is the proposed delivered cost of this electricity for the UAE? What are they paying now? esquilax, on 23 February 2011 at 11:44 AM — That figure is the latest new solar thermal going up in the Mojave Desert. I doubt the cost differs much in the UAE. By taking the effort to check the CIA’s world factbook you’ll find just how much nagas the UAE used recently; I already posted a conclusion based on that on this thread. I don’t know the UAE price for electricity from natgas, but in California its currently around 9 cents/kWh and less than that (closer to supply) up here, probably quite a bit less. esquilax, on 23 February 2011 at 11:44 AM — My figures are always busbar (genration) costs. To that add transmission and distribution costs. Locally, that adds about 4.1 cents/kWh, but that will vary with the utility in question. An addendum to ‘commercial’ EGS; I need hardly point out that Landau benefits from Germany’s generous feed-in tariff scheme (nuclear, needless to say, does not), so the extent to which it’s truly ‘commercial’ is arguable. Not as much as you might think. Scroll to Geothermal. The politics of this UAE deal are fascinating. Prior to signing it was widely expected that the UAE simply could not finance such a project. The debt of the UAE is massive. It seems the Korean Government and Samsung have agreed to cheaply finance $10b of the $20b, which helped make their solution some $6b cheaper than the Avera led consortium. Can you say massive, real, loan subsidy? My sister lives in Dubai. She pays 6.25c/kWh, plus 1.2c/kWh fuel surcharge basic rate up to 2000kWh/mth. High use tariff climbs to a little over 11c/kWh. Power costs are subsidised by the Dubai Government. BHP Billiton, Australia’s largest mining company, has just announced a major acquisition of shale oil assets in USA and Canada. the wind farms will continue being commissioned year-by-year because the law says the energy retailers must buy their output or pay a thumping penalty. The RET is set in political concrete and will rise in cost each year as the next tranche of its ultimate level of 31,000 gigawatt hours in 2020 is phased in. If you think gas is the answer to cutting emissions, keep advocating for a carbon price. If you want to get low-emissions electricity in Australia, at a price that will facilitate clean electricity substituting for fossil fuels elsewhere in the economy, you should stop advocating for a carbon price and instead, agitate to get the impediments to low-cost nuclear removed. Yes, Barry, and I’ll claim I told’em so too. I’ve provided the link to this excellent paper several times. It points out one of the key problems with HDR/HFR/EGS hyrdothermal. that is the fractures in the rockmass are not perfect planar fractures with a constant apeture and even hydraulic conductivity over the whole fracture surface. This is what is needed to extract the heat from the rockmass. the heats is extracted as 1/m2 of fracture surface over which water flows. We need the water to flow over most of the fractur surface and fairly evenly. But what actuall happens is the water finds the easiest paths beteween the injection boreholes and the production boreholes. In effect it “channels”. And the tendancy is to develop chanels over time. So, for this and many other reasons, a geothermal site may look godd at the start and attract investors. But the smart ones get out and run with their money before the production falls away. The 30 year life proposed by the developers and used for marketing do not eventuate. HDR/HFR/EGS geothermal is at an even earlier stage on the technology life cycle than solar thermal and solar PV. It beats me how organisations like IEA, EIA, DOE, ACIL-Tasman, EPRI can quote LCOE for HDR/HFR/EGS and imply they have confidence in such figures comparable with the LCOE for nuclear. The level of due dilligence we require of our public companies is not being required for government subsidies for renewable energy. You know what Write Down and Write Off are and why they’re used? Patience is not necessarily vested with big energy businesses when the tax man might provide a handy out. Like everything in this country, we probably have to wait for the Americans or the Germans to figure it out for us. Meanwhile talented people spend their waking moments dreaming their favourite nuclear fantasy. Where is a definitive LCoE figure from any of those organisations for EGS? Lasala etc gave DoE’s aim to have EGS around the same price point as hydrothermal by 2040. MIT gave wide range etc, on and on. You can see the figures on the AEMO web site and in ABARE reports. According to Ziggy Switkowski’s article, UAE started on its path to get nuclear in 2007, the first unit will be on line by 2017 and the fourth by 2020. The John Howard Government commissioned the “Uranium Mining, Processing and Nuclear Energy” study in July 2006 and it was tabled in Parliament in December 2006. The Howard government offered the electors the nuclear option at the 2007 Election. The electors rejected it because of Labor’s anti-nuclear scare campaign. Government we could have been on roughly the same trajectory for implementing nuclear as UAE. And we could have been confident anything the government did would not ruin our economy. We’ve wasted another 5 years at least and are at serious risk of seriously damaging our economy.